Rainbow Dragon is 65' long, 20' wide and 20' high. The materials are painted aluminum and dichroic acrylic. 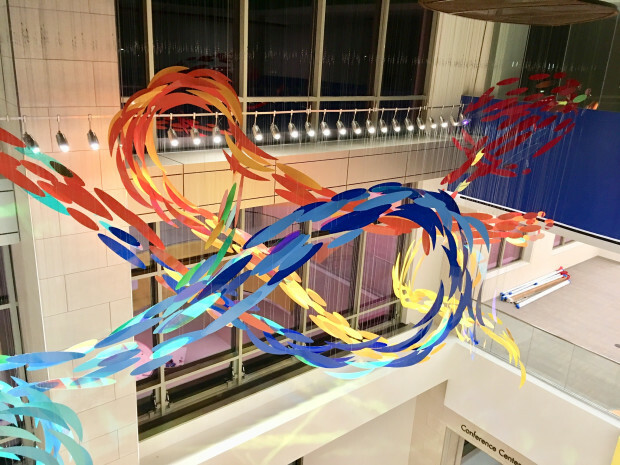 This suspended sculpture is in the lobby of a new children's hospital. The color scheme for the hospital is the rainbow. I wanted the sculpture to be exuberant and playful. The client wanted the sculpture to be visible from all floors and they wanted implied rather than actual movement. I worked closely with Skyline Art Services and the architects, HKS, Inc. I proposed several different pieces and the client chose the dragon. I met with all the stakeholders and resolved all their concerns and incorporated some of their suggestions.